Xiaomi has introduced Mi A1 Android One Smartphone with a Dual Rear camera and Octa Core Processor which is similar to Moto G5s Plus. 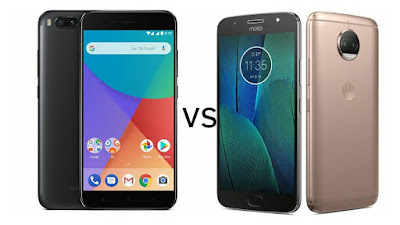 Check out Price, Specs, Features comparison between Mi A1 and Moto G5S Plus. Both Phones comes with Metal Body, Fingerprint Scanner, 5.5-inch (1920 x 1080 pixels) Full HD display powered by 2.0 GHz Octa-Core Snapdragon 625 Processor with Adreno 506 GPU. Moto G5S Plus comes in Lunar Gray and Blush Gold colors Priced at Rs 15999 whereas.Xiaomi Mi A1 comes in Black, Gold and Rose Gold colors priced at Rs 14,999. Both offer similar specs run on Stock Android.